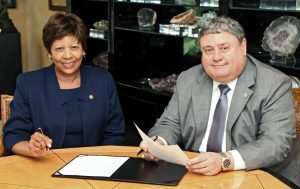 Stillman College President Dr. Cynthia Warrick, left, signs an articulation agreement with United States Sports Academy President and CEO Dr. T.J. Rosandich. DAPHNE, Ala. – The United States Sports Academy recently entered into an articulation agreement with Stillman College that aims to help students from the historically black college pursue careers in the world of sport. Stillman College President Dr. Cynthia Warrick recently visited the Academy campus in Daphne, Ala., to sign the agreement with Academy President and CEO Dr. T.J. Rosandich. Stillman is a historically black liberal arts college located in Tuscaloosa, Ala. Under the agreement, the Academy will admit qualified students from Stillman’s bachelor’s degree program into its Master of Sports Science degree program, which offers majors in sports coaching, sports health and fitness, sports management, sports studies and recreation management. The Academy’s master’s degree is a fully online, flexible program that allows students to enroll and start at any time, as well as complete the degree at their own pace.  The Academy will also waive application fees for any Stillman student graduating with a physical education degree and will allow Stillman students to begin Academy coursework without official graduation status, provided all other admission requirements are met. Qualified members of the Stillman faculty may also be invited to become members of the Academy’s National Faculty, a group of faculty who teach for the Academy’s post-secondary non-degree international sports education programs. 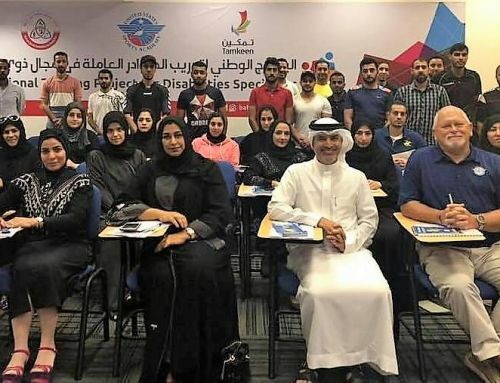 The Academy also offers an upper division Bachelor of Sports Science degree program that provides the subject specific courses typically taken during the student’s junior and senior years. The agreement provides for Academy bachelor’s students to be able to take their required general curriculum core coursework at Stillman; these courses typically are taken in the freshman and sophomore years. “This agreement creates an opportunity for our students in physical education and related majors to get their graduate studies and experience from an excellent academic program,” Warrick said. “Physical education is one of our largest majors so many of those students are looking to get certification as teachers or coaches and they are interested in sports careers. This will be really important for our students. 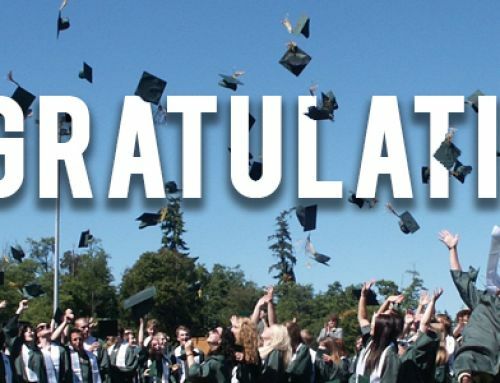 “The Academy is very pleased to be able to partner with such an historic institution and a fellow member of the Alabama Association of Independent Colleges and Universities (AAICU),” Rosandich said. Academy Dean of Student Services Dr. Vincent Nix said the agreement is a “win-win” for both institutions. “The agreement provides a seamless avenue for their students to continue graduate studies in a field about which they are passionate,” Nix said. “If they earn a bachelor’s degree in physical education and are interested in a career in sports, this is a natural fit for those students. It will allow them to continue their studies and be able to work while they do it. “We are partners; this agreement will benefit students of both institutions,” he said. Stillman College is a “liberal arts institution committed to fostering academic excellence and to providing high quality educational opportunities for diverse populations with disparate levels of academic preparation. Primarily a teaching institution, Stillman has a proud and evolving tradition of preparing students for leadership and service in society.” For more information go to www.Stillman.edu.